A new system which allows patients to view their own medical records and even find out test results over the internet is about to be extended to 100 other surgeries. It has been tried out by a handful of GPs, and the system has been successfully pioneered in a practice where winning the trust of patients hasn't been straightforward. I visited the doctor's surgery which several years ago was attracting headlines for the darkest of reasons - the previous incumbent was Harold Shipman, Britain's most prolific serial killer. The surgery lies in a quiet unremarkable residential street on the outskirts of Manchester. The practice is again receiving nationwide attention - but this time, it is because of the way it is putting information in the hands of its patients. 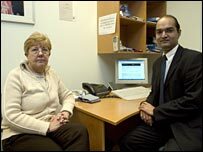 Dr Amir Hannan, who began his career at Shipman's old practice when he was fresh from his GP training, is behind the internet scheme. He told me: "The week before I started there was a sit-down protest in the waiting room, because the patients were not happy about this doctor that was being foisted on them. "That gives you some idea of the battlefield I was walking into." One of his patients, Yvonne Bennett, said: "A lot of patients never saw the two sides of Dr Shipman. I was very fortunate in only seeing a very good side. "So there was a concern when we got a new doctor - is he any good? Perhaps he's got a dark side to him too?" 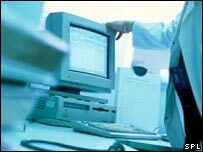 Trust has gradually been restored in Hyde, to the extent that 150 patients at the practice have been given access to their medical records and test results over the internet. The system is run by Emis, a company which supplies computer systems to many GP practices in the UK. It isn't part of the government's national IT programme for the NHS, though experts are apparently interested. Patients using the system go online to order prescriptions, communicate with their GP or even to print off their medical records to take to appointments with hospital consultants. Many, like Yvonne, are older patients with ongoing conditions such as asthma. But does she worry about the confidentiality of such personal information? "Very few patients have concerns about the security of the system," said Yvonne. "That doesn't mean we're all stupid, and we don't think anything can go wrong. "If you don't keep your password secure, don't go complaining about the system - it would be your own fault." In a nearby tower block, Margaret, a 78-year-old widow, is getting to grips with broadband and her laptop. Like Yvonne, she feels the internet access has given her more power as a patient. Margaret told me: "When I went to the hospital, I found I became a person, rather than just a sheet of paper. It's my body and I like to know what's happening to it." Dr Hannan admits the system isn't for everyone, though. He has many patients from the Bengali population - and none of them have so far come forward for internet access to their records. All patients signing up have a two-hour meeting, in which all the potential pitfalls are discussed. Dr Hannan said: "We talk about what happens when test results come back into the practice - and what it means for the patient to see those without the doctor or nurse being present." I asked whether that could mean someone finding out they've got cancer while they're on the internet at home. "Well, it's a possibility," he said, "and we talk about that. "Remember that patients don't come in saying 'I've got cancer, doctor, please diagnose me'. "They'll come in with a cough or various symptoms and it's up to me then to try to identify what the cause is." This new technology is only available in practices that are part of the scheme. Some people might be suspicious - but it clearly has the potential to radically change the relationship between doctors and patients.